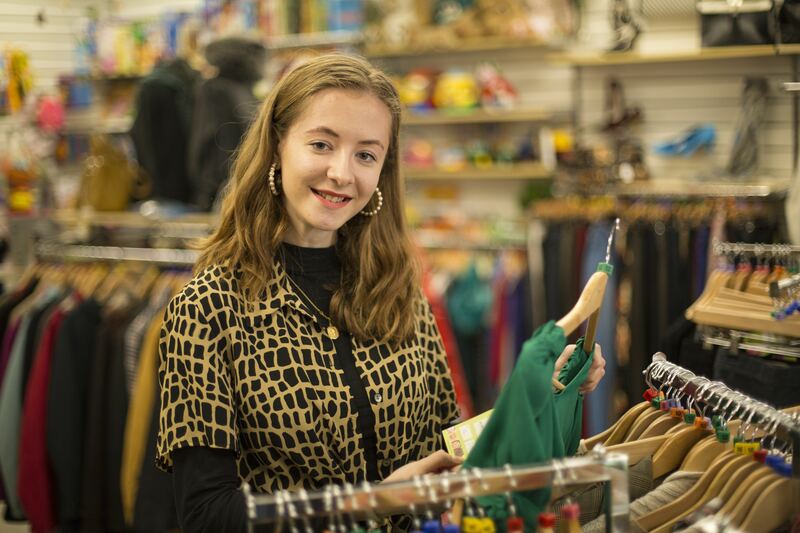 To mark Student Volunteering Week 2019, from February 11-17, we spoke to second year Exeter University art history student Niamh O'Riordan-Mitchell about why she volunteers her time at Children’s Hospice South West’s charity shop in Sidwell Street, Exeter. It was while walking home from campus one day last October that Exeter University student Niamh O'Riordan-Mitchell spotted a notice in a charity shop window asking for volunteers. “I had never volunteered in a charity shop before but thought I could use my spare time during the week to lend a helping hand,” said Niamh. “As an Essex girl, volunteering at the charity has allowed me to learn more about the West Country and the great charity work that goes on; on a more personal level than say a national charity. "Exeter has welcomed me and is now my second home. Through volunteering, I feel more part of the community as I chat to people who come into the shop, as well as the other lovely volunteers who I now call friends. Niamh volunteers two days a week on a Monday and a Wednesday for a few hours each day. She was able to choose the times she wanted to volunteer to fit around her university timetable and studies. Her work at the shop involves sorting donation bags, steaming and pricing donated clothes, putting them out on the shop floor and dressing the shop window. She also uses the till to serve customers. Asked which one word she would use to describe volunteering, Niamh said ‘warm’. Whenever I volunteer, I feel appreciated and loved by those I volunteer with. "The conversations we have, and the laughs, are all part of growing up and life. The best thing about it is the social element of talking with people from the older generation. I know that they enjoy talking to younger people being able to listen to their stories and spending time with them. It’s a lovely friendly environment and I have made new friends; young and old. Niamh also has a part-time job with the Salvation Army and is a co-project leader of student initiative Provide a Pad, which collects sanitary products to be distributed to the homeless. During her first year at university, she was a volunteer dog walker and spent time with primary school art pupils. While in secondary school, she did some work experience at AGE UK. She hopes to go on to study an art history or public history master’s degree, and after university, run outreach programmes for art galleries and museums to encourage and promote arts education. Niamh said volunteering was not just another string to her bow, but an important part of the university experience as a whole. I would urge students to really consider volunteering as part of their whole university experience. "It allowed me to feel part of Exeter’s community and interact with local people who really care for Exeter. From someone who’s home is more than four hours away, I feel relaxed and comfortable in Exeter now as I have been able to fully integrate and not feel as homesick as before. To find out more about volunteering roles at Children’s Hospice South West, visit our dedicated volunteer page.